Maja held various positions in the Croatian Ministry of Foreign and European Affairs between 1996 and 2016. Based in Brussels from 1999 until 2011, she was responsible for horizontal coordination of the Croatian accession negotiations. In 2011, she moved back to Zagreb and was responsible for setting up and management of the system of national coordination of European Affairs. In 2015 she became Assistant Minister for Europe in the Ministry of Foreign and European Affairs. On 1 December 2016, she became Deputy Director-General in the Directorate-General for Mobility and Transport, responsible for coordinating the activities related to investment, innovative and sustainable transport, in support of President Juncker's political priorities. Despina Spanou is the Director for Digital Society, Trust and Cybersecurity at the Directorate-General Communications Network, Content and Technology. In this capacity she is responsible for cybersecurity policy and law, digital privacy, connected cities and mobility, digital health and e-government as well as electronic identification. She was previously Director for Consumer Affairs at the Directorate-General for Justice and Consumers (2013-2017) in charge of consumer policy, consumer and marketing law, redress and enforcement, and product safety. In that role she oversaw the recent overhaul of consumer law and enforcement as well as the integration of consumer policy in the digital single market strategy. She has served as Principal Adviser in the Directorate-General for Health and Consumers where she was responsible for communication and also led the work on strategies on managing chronic diseases including the EU's contribution to the UN General Assembly on Health. Jean Schiltz works as a consultant for the Ministry of the Economy since April 2017. His current position involves the development of a smart mobility ecosystem in Luxembourg, as well as advice in all matters related to the use of innovative technological solutions in mobility and transport. From 2011 to 2017, Mr. Schiltz has held various positions of responsibility at the headquarters of Volkswagen AG. His involvement has extended across the automotive development process ranging from the definition of the initial product mission, through concept development, up to the start of series production. Car models he has worked on are now starting to appear in different international markets. Before that, Mr. Schiltz has worked as a Project Officer for Luxinnovation on the promotion of Design as a strategic tool for innovation and on the development of the Creative Industries sector in Luxembourg. Passionate about all things moving, Mr. Schiltz has graduated with honours from the University of Birmingham (UK) in automotive mechanical engineering, before completing another Master’s Degree in industrial transportation design at the Institut Supérieur de Design Rubika (FR). Dr. Thomas Becker graduated in business economics from Cologne University in 1991. Three years later he received his doctorate. From 1995 to 2002 he worked for the Federal Association of the German Industry (BDI) in the field of environmental politics. From 2002 to 2006 he was head of the economics department at the Confederation of the Automotive Industry (VDA) in Frankfurt. There he was appointed vice chairman in 2006. Since 2007 he is Vice President of the Department of Government and External Affairs at BMW Group in Munich, Germany. Robert MacDougall is Head of Enterprise Public Policy at Vodafone Group, where he leads on all public policy matters relevant to Vodafone’s enterprise activity. Robert has spent the majority of his career in electronic communications policy and regulation, including eight years at the UK’s Communications Regulator Ofcom (and its predecessor Oftel). Prior to joining Vodafone, he was an Assistant Director at the UK’s Competition and Consumer Protection Authority. This included a secondment to the US Federal Trade Commission as an FTC International Fellow. 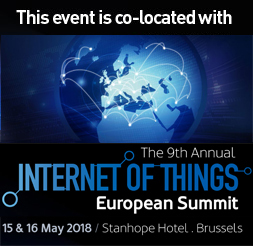 Robert was the inaugural Chair of the Policy Working Group of the Alliance for Internet of Things Innovation (AIOTI), which was initiated by the European Commission to contribute to the creation of a dynamic European Internet of Things ecosystem. He currently leads on EU policy for the 5G Automotive Association (5GAA), a consortium of automakers, information and communication companies and telecommunications operators that seeks to develop, test and promote communications solutions, initiate their standardization and accelerate their commercial availability and global market penetration to address society’s connected mobility and road safety needs. Andreas Geiss is currently Acting Head of Unit for Radio Spectrum Policy in DG INFSO of the European Commission. His responsibilities include the implementation of the inventory in accordance with the Radio Spectrum Policy Programme. Andreas has been working for the European Commission since 2002. He started his professional career in 1991 at the German Regulatory Authority in the area of telecommunications. From 1994 until 2002 he worked for the European Radiocommunications Office (ERO), where he was project leader for many projects dealing with terrestrial and satellite mobile communications. He has been involved in the European preparations for World Radiocommunications Conferences since 1995. Andreas is a telecommunications engineer by profession and enjoys all sorts of sports in his spare time. Apostolos Kousaridas received his PhD from the Department of Informatics & Telecommunications at the University of Athens. He holds B.Sc. degree in Informatics and M.Sc. degree in Information Systems from the Department of Informatics at Athens University of Economics and Business. He has worked as Technical Project Manager in the Innovation Center of Velti and as Senior Researcher for the University of Athens. Currently, he is Senior Research Engineer of the Huawei Technologies in Munich, contributing to the design of 5G communication systems and the Internet of Vehicles. He has disseminated over 40 publications in international journals and conferences in the area of wireless/mobile networks and he has contributed to ETSI NTECH/AFI, 3GPP and 5GAA. His research interests include vehicular communications, wireless networks, network management and cognitive adaptive systems. Jozef Svrcek is a director of Specure GmbH, based in Austria, Europe, with 5 years of spectrum auction consulting experience and over 16 years in the information technology and telecom industries, with a focus on project and infrastructure management. Prior to joining Specure, Jozef worked for Deloitte as a senior consultant, specialising in the information technology related risks. Earlier in his career, he was an IT project manager for a global pharmaceutical company Bayer – Schering based in Berlin and Leverkusen, Germany. Jozef has provided technology and consulting services for telecom auctions in the Slovak Republic in 2013, Czech Republic in 2012, 2013 and 2015. He was the team leader at the most recent auction in Podgorica, Montenegro (CCA frequency auction in 800 MHz, 900MHz, 1800MHz, 2 GHz and 2.6 GHz). Jozef holds a Master’s degree in Enterprise Systems Implementation from Cranfield University, UK and a Master’s degree in Musicology from Comenius University, Slovakia. Catrine studied law at Gothenburg University and at Marc Bloch University in Strasbourg. She then worked as a political adviser in the Gothenburg City Hall before joining the Cabinet of Commissioner Cecilia Malmström. Catrine worked in the cabinet of Commissioner Malmström both in her role as commissioner for Home Affairs, as well as for Trade. Since March 2018, Catrine is the Head of Office for City of Gothenburg European Office. Born in Madrid (ES) in 1971. Graduated as an engineer from the Polytechnics University of Madrid. Since 2000, civil servant in several Spanish Ministries, such as Industry, Research, Defence and Justice. As from 2012 engaged in the Automotive and Mobility Industry Unit in the European Commission (DG GROW). Policy officer for motorcycles, tractors, engines for non-road mobile machinery, access to vehicle repair and maintenance information and access to in-vehicle data. Max Lomuscio joined DOVU in 2018 to drive the growth of the company towards mainstream adoption via the engagement of its stakeholders. Prior to that, he worked at General Motors holding a number of positions across the World in the financial area, IT and marketing. Abayomi started his career as a researcher at the Loughborough Accident Research Unit where he helped to develop a standardised methodology for car accident reconstruction and performed analyses for vehicle manufacturers and government bodies. He joined the BMW Group in 1997 starting with the development of passive safety concepts. 2000-2014 he specialised in concept development for pedestrian protection systems and represented the European Industry at international level for the development of legislative and consumer pedestrian testing procedures. In March 2014 he moved to the BMW EU Representative Office where he is responsible for all technical dossiers being worked on by the EU Institutions. Dimitri Vergne is Senior Sustainable Transport Officer at the European Consumer Organisation (BEUC). He is well-versed in EU political affairs, after studies in France, Germany and at the College of Europe in Bruges. After complementing these studies with internships at the German Bundestag and European Commission, Dimitri moved into the field of EU road transport. Here, he represented the interests of the Renault-Nissan-Mitsubishi alliance for four years. Dimitri now works on behalf of Europe’s consumers, advocating for EU legislation that will spur the transformation towards a future of clean mobility. Joost Vantomme is Smart Mobility Director at the European Automobile Manufacturers’ Association (ACEA), which represents the Europe-based car, van, truck and bus makers. Joost has over 25 years’ experience in legal, regulatory and public affairs. He served as legal director and thereafter as regulatory affairs director in the telecommunications, postal, logistics and automotive sector. He had leading policy making roles in European associations such as PostEurop and FEDMA, as well as at the UN level (UPU). Joost has also been member of the cabinet of the Belgian Minister of Economy and director at Hill+Knowlton Strategies, an EU consultancy firm. In late 2014, he joined Febiac (the Belgian automotive federation) as director. Since 1 September 2016, Joost holds the position of Smart Mobility Director at ACEA, bringing his vast experience together to address the challenges of connected and automated mobility. As a frequent speaker at conferences and author of papers, he engages with stakeholders on European and international policy issues in a digital agenda context. Joost holds a Master in Economic Business Law, a Master in Law and a Diploma in Teaching Law (Universities of Leuven, Poitiers and Louvain). He is fluent in Dutch, French, English and German. Vincent started his career at IBM then joined the first startup building mobile apps in Brussels. After that he founded a digital agency PINCH and launched Assisto, a mobile app and cloud based system, with focus on the first notice of loss and the European Accident Statement form. Its approach is very much user centric and adds great value to the entire claims management process. Vincent holds a Masters degree in Mathematical Engineering from the University of Louvain (Belgium). Proud father of two, former field hockey player and recent golf addict, Vincent is a never ending digital enthusiast. Ian Bundey is Senior Business Solutions Strategist within Accelerate Advisory Services for VMware EMEA. His role centres on assisting customers with IT planning and business architecture development, as well as providing advice to C-suite leaders on long term technology investments. His responsibilities also include leading business development for VMware IoT in Northern Europe. Chris Carroll has been the Policy Director at FIA Region I since September 2017. The FIA Region I office, based in Brussels, is a consumer body representing 107 Mobility Clubs and their 38.5 million members from across Europe, the Middle East and Africa. Chris is responsible for overseeing all policy affairs of the office including on connectivity, sustainability, safeguarding mobility and the environment. Before joining FIA Region I Chris worked in the advocacy field for the past 8 years in Brussels on maritime and road transport affairs. Chris has also worked in the private sector as a market analyst in London for the energy information service Platts. Stefano Peduzzi is the European Director at Geotab GmbH. He has 15 years of international experience within IT and telematics. His specialty is the evaluation and development of new technologies, particularly in start up companies and business units. The combination of both a sophisticated theoretical and technical background, and a deep business expertise has allowed Stefano to grow Geotab’s European team from the ground up. Stefano now balances the leadership of more than 10 team members covering solutions engineering, project management, marketing, and business development. In addition to facilitating the growth and scale of Geotab Europe, Stefano is passionate about new technology, traveling, and discovering new cultures. He holds a Masters degree in Engineering. Chris has a degree in mathematics and statistics from Manchester University. of tolled road infrastructures operators gathering 23 national members and managing more than 50.000 km. of road networks. Johanna Tzanidaki has a PhD in EU Law from the Universities of Southampton and Cambridge, in the UK and has professional qualifications in Project Management (PRINCE2) and CSR. Specialised in EU Affairs and Policy, previously she was the Director of Public Affairs at TomTom where she was responsible for liaising with other ITS stakeholders on policy recommendations at national and EU level. She was also TomTom spokeswoman within the industry and public authorities associations (ERTICO, TISA, iMobility and C-ITS Platform). Johanna was a member of ERTICO Supervisory Board representing TomTom and the Service Providers sector (2012-2017). She has launched and co-Chaired the ERTICO Innovation Platform TM 2.0 on Interactive Traffic Management since 2014. France, and an independent international expert in telecommunications and the digital economy. Telecom ParisTech is a first-tier European Research and higher education institution. It encompasses all discipline areas, sciences, technologies, social sciences, of relevance to information and telecommunications technologies and the media. Gérard POGOREL published in 2017 a widely circulated and influential position paper Spectrum 5.0 Improving assignment procedures to meet economic and social policy goals He co-authored in 2014 a report to the Prime Minister of Italy assessing the investments by operators in NGAN networks in the EU Digital Agenda perspective. He was an independent member of the Organo di Vigilanza, of Telecom Italia Open Access (2008-2012) monitoring access to the incumbent’s network. He co-founded and acted as Chair/Rapporteur of the European Spectrum Management Conferences since its creation in 2006. He was previously Chair of the European Union Framework Research & Technology Development Programme Monitoring Panel, and Chair of the Monitoring Committee of the EU Information Society and Technologies Research Programme. He participates in numerous Government-level and regulation Authorities Committees and Scientific Committees on telecom and media policy and regulation in Europe, the USA and Asia. He published numerous articles, books, and reports including: “Spectrum 5.0: improving assignment procedures to meet economic and social policy goals”, “Valuation and pricing of licensed shared access: next generation pricing for next generation spectrum access”, “The digital dividend: radio spectrum, mobile broadband, and the media: Towards a policy framework”, Open Society Institute (2011), “The Radio Spectrum: managing a strategic resource”–with JM Chaduc, (Wiley-ISTEC London, January 2008), Nine regimes of spectrum management: a 4-step decision guide, Communications & Strategies, April 2007. His current research focuses on the design of network investments incentives, the award of frequency licences, and competitive market dynamics in the digital economy, He is a member of the international panel of experts for the World Competitiveness Yearbook. He lectures extensively in Europe, the US, and Asia. Gérard Pogorel is Officier des Palmes Académiques. Over a decade of experience in the antitrust and competition law arena in Brussels enables Gianni to help clients find solutions to the most complex antitrust issues they face – globally, in Europe, in certain Member States (including Belgium, France and Italy) and in other regions such as the Middle East. Gianni regularly manages global teams for in-depth (Phase 2) merger cases (including the General Electric/Alstom Energy case, which dealt with an unprecedented array of substantive, procedural, jurisdictional and political challenges in over 30 jurisdictions) as well as some of the most complex global cartel investigations (Air Cargo, Automotive, Batteries, Video Tapes, and Smart Card Semiconductors). In recent years Gianni has been developing in-depth expertise in the automotive (e.g., OEMs and insurers) industries. He has also started focusing on EU regulatory growing areas (e.g., the single market information tool, parallel trade, geo-blocking) as well as disruptive technologies (e.g., connected cars and blockchain). Gianni is a Non-Governmental Advisor to the European Commission within the International Competition Network, a General Editor of the Journal of European Competition Law & Practice (at Oxford University Press), an Editor of WomenAT, and a Founder of Antitrustitalia. He works regularly in English, French and Italian and sometimes in Spanish.